Micro Medical has been supplying the medical-device market since 1986, and as it nears its 25th anniversary providing medical-device OEMs with stamped and molded parts and assemblies, its executives share some valuable insights on what it takes to serve this growing yet demanding industry. Quality, cost, productivity and efficiency-- all improved after life-science-industry supplier Helmer Inc. introduced a new automated laser-cutting cell and six-axis press brake to its newly minted production facility. Stamping and rolling tubular products in the die--a proprietary, complex process that combines progressive-die operations with transfer--allows this German-related U.S. stamper to save its customers as much as 25 percent in piece-part cost compared to using machined tubing. This article is excerpted from Drew Stevens' 2009 book, Die Protection for Lean Manufacturing, available from the Precision Metalforming Association; 216/901-8800; www.pma.org/mfmarket. Stevens also writes a column on die protection for the monthly Tool & Die Authority e-newsletter. 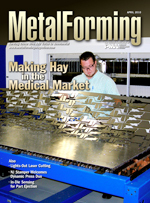 To subscribe, visit www.metalformingmagazine.com/toolanddie.